The Daba Mountains are considered one of the purest places throughout Asia and are listed by the World Wildlife Fund (WWF) as one of the world's 200 ecoregions. (Chinese name - Dabashan) this mountain range in Central China lies between the Yellow and Yangtze Rivers. The southern slope of the Daba Mountains drains into the Sichuan Basin or directly into the Yangtze via short streams that flow into the river in the Three Gorges area, such as the Shen Nong Stream. The northern side drains into the Han River, a major tributary of the Yangtze, which, however, does not join the Yangtze until some hundreds kilometers to the east (in Wuhan). The Daba Mountains' highest points are Mt Taibai 3,750 meters (12,303 ft) and further east, the Shennongjia massif in Shennongjia Forest District. The three tallest peaks, located west of Muyu town, are Shennong Deng ("Shennong Peak", 3,105 meters (10,187 ft) elevation), Da Shennongjia ("Great Shennongjia", 3,052 meters (10,013 ft)), and Xiao Shennongjia ("Lesser Shennongjia", 3,005 meters (9,859 ft), on the district's border with Badong County). 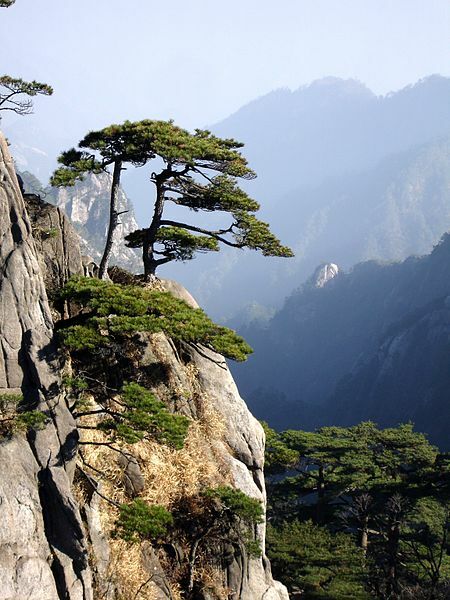 Laojun Shan, 2,936 meters (9,633 ft) tall, is located northeast of Muyu. In the southeast, the Daba Mountains are joined to the Wu Mountains, which block the Yangtze's flow out of the Sichuan Basin. In the east, the small Jingshan Range (in the southern part of the Xiangyang Prefecture) can be viewed as the extreme extension of the Daba Mountains. In the northeast, the Wudang Mountains are nearby; some authors even consider them a "branch" of the Daba Mountains. In the rural counties of southern Hanzhong, in Shaanxi Province, there is a large area of karst with some of the largest sinkholes in the world, known as the Shaanxi tiankeng cluster or "Hanzhong tiankeng group". It covers nearly 5019 square kilometers and is located in four counties, Ningqiang County, Nanzheng County, Xixiang County, and Zhenba County, with the largest sinkhole (520 meters in diameter and 320 meters deep), near Sanyuanzhen (三元镇) in Zhenba County. The natural landscape of the region, the Daba Mountains evergreen forests, is listed by the World Wildlife Fund (WWF) as one of the world's 200 ecoregions that should be a priority for conservation. Dabashan National Nature Reserve is located in the Chongqing part of the Daba Mountains (Chengkou County); Shennongjia Mountain Nature Reserve (704 square kilometers (272 sq mi), in Hubei (Shennongjia Forestry District). The Dawn Redwood (Metasequoia glyptostroboides) is a deciduous conifer endemic to the Daba Shan, whose nearest living relatives are the Coast Redwood and Giant Sequoia of California. Redwoods formerly ranged across the northern hemisphere, but were thought to be extinct outside California until stands of Dawn Redwood were discovered in the Daba Shan in the 1940s.